Booknotes & Vietnam · Booknotes & Vietnam · One Book. One Author. One Hour. Before embarking on a successful media and communications career in the private sector, Brian Lamb served in the armed forces as a Lieutenant in the United States Navy from 1963 to 1967. His military service ran concurrently with the U.S. involvement in Vietnam. Approximately one out of every six Booknotes interviews dealt with works of military history. Among them there were several which were about the Vietnam War. Neil Sheehan’s book about the Vietnam War, Bright and Shining Lie, was C-SPAN’s first-ever author interview series. Brian Lamb followed Sheehan’s progress on the book during the sixteen years it was being written. Concerned that Bright and Shining Lie might not get the in-depth coverage that he felt it deserved, Lamb invited Sheehan to take part in a series of interviews to be televised on C-SPAN in October and November 1988. 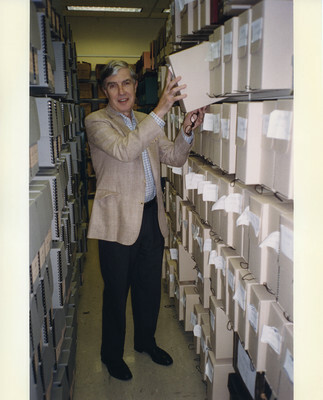 In this photograph, taken by Brian Lamb, Sheehan is examining archival boxes at the Library of Congress in Washington, D.C.
CBS News Vietnam correspondent John Laurence spent 22 months reporting from Vietnam during the period from 1965 to 1970. While embedded with U.S. Army troops, Laurence witnessed some of the most difficult and brutal events of the war, such as the Tet Offensive, the Battle for Hue, the siege at Khe Sanh, and other actions first-hand. In 1968 he came upon a cat in the city of Hue who became his companion for the remainder of the war and afterward. 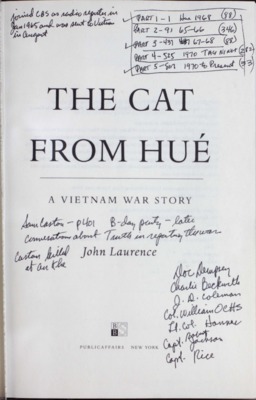 The item here depicts Brian Lamb’s heavily annotated version of The Cat from Hue that he used to prepare for his January 2002 interview with Laurence. Frederick Downs, a former U.S. Army officer who lost his arm in Vietnam, is interviewed as part of the "Booknotes" Oral History Project on May 15, 2014 at George Mason University in Fairfax, Virginia. Downs discusses his appearance on C-SPAN's "Booknotes" program of January 1992, where he discussed his book No Longer Enemies, Not Yet Friends: An American Soldier Returns to Vietnam. The book deals with his service in the War and his return to Vietnam in the late 1980s to help in the repatriating of the remains of fellow American servicemen. Robert McNamara, Secretary of Defense during the Kennedy and Johnson administrations, appeared on Booknotes in April 1995 to discuss his book In Retrospect: the Tragedy and Lessons of Vietnam. 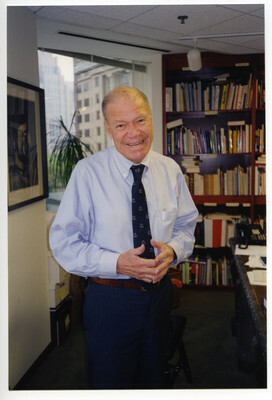 He is shown here in his office in downtown Washington, D.C. In his "Booknotes" interview with Lamb, McNamara related that he began writing the book in this office in long-hand, without the aid of a computer, research, or notes. Robert Timberg, a Naval Academy graduate and journalist for the Baltimore Sun, is interviewed as part of the Booknotes Oral History Project on September 26, 2014. Timberg discusses his appearance on C-SPAN's "Booknotes" program in August 1995, where he discussed his book, The Nightingale's Song. The book is about the military and political careers of John McCain, Bud McFarlane, Oliver North, John Poindexter, and Jim Webb, all of whom were graduates of the United States Naval Academy and served during the Vietnam War.